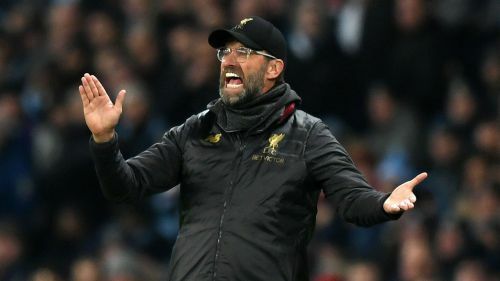 Jurgen Klopp says he "would have paid money" to be four points clear of Manchester City in the Premier League after two games against the champions this season. City ran out 2-1 winners in their meeting at the Etihad Stadium on Thursday, moving them back to within four points of the leaders and inflicting a league defeat on the Reds for the first time this season. Defeat saw Liverpool ultimately pass up the chance to go 10 clear of City, something that, in the eyes of many, would have effectively ended the hosts' title hopes. As it was, Leroy Sane's 72nd-minute winner blew the title race open once again, as the German clinched victory after Roberto Firmino had cancelled out Sergio Aguero's emphatic opener. Nevertheless, Klopp did not want to focus on the negative, adamant he never thought it possible to be clear of City after playing their two regulated Premier League fixtures. "If someone had told me after both games against Man City that we were four points clear, I would have paid money for it, you cannot believe," Klopp told reporters. "I didn't think it would be possible. Football is like this. If we win this [match] and are 10 points ahead and from that point win no games, then nothing happens. It's really important we take it game by game. "If we would have won the title five times in the last 10 years, we would say; '100 percent [we'll win it]'. But we don't have experience in it, so why act like someone who wins all the time? "We never won it as a team so we want to finish the season as good as possible, and that's alright, we can, we're still in a good position. "It is all fine for us. Not in the moment, it feels really bad, but it is only a moment. Then we have an opportunity to work on it." Liverpool looked sharper in midfielder after Fabinho had replaced James Milner in the 57th minute, though Klopp did not feel the Brazilian suited the system he wanted to start the match with. "System wise it wasn't a real alternative in the beginning and we adapted well after we changed, only because Gini [Georginio Wijnaldum] played really well on the left wing, or half left wing, if you like," Klopp said. "Hendo [Jordan Henderson] was really impressive, and offensively I think we already had more moments [than City] in the game [before Fabinho came on], that's what we showed the boys at half-time. "Immediately [after half-time] we were a major threat for them. We came through, passed through, the chance of Sadio [Mane] was great. "There were others moments when we took the ball and accelerated, not immediately passing, because if you can outplay the counter-press every team in the world struggles, even City. "We had these moments and sometimes the cross wasn't good enough, or the pass – that happens. It's not about two players [Fabinho and Milner]. "You have to constantly work for momentum. That was the game today. There were a lot of really wild moments, a lot of rusty moments. It was really intense for both teams – they won, we lost, that's how it is sometimes."